It didn't look like he would for much of the weekend either. Nico topped all three practice sessions and for far from the first time in 2016 looked serene. 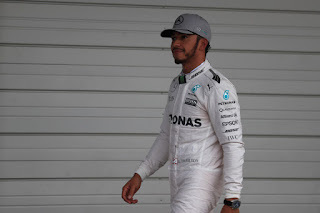 It remained that way for much of the qualifying hour also - he was 0.360 seconds up on his Mercedes team mate Hamilton in Q1 despite conspicuous errors on his lap (though Lewis made mistakes too). Then in Q2 Nico's effort to set a 1m 30.714 was one of those that draws a round intake of breath. Lewis was upwards of four tenths off him at this point. As always with the Englishman there was a note of caution though. We know that however much he is apparently flailing he always is capable of producing a rabbit from thin air. And not just on snapchat. He very nearly did too. In the first runs of Q3 Nico didn't match his time from the previous part, while Lewis improved to move smartly into the vacated space, getting a 1m 32.7 of his own for provisional pole which was two tenths up on his antagonist. In the end though Nico made good on his dominance - just. 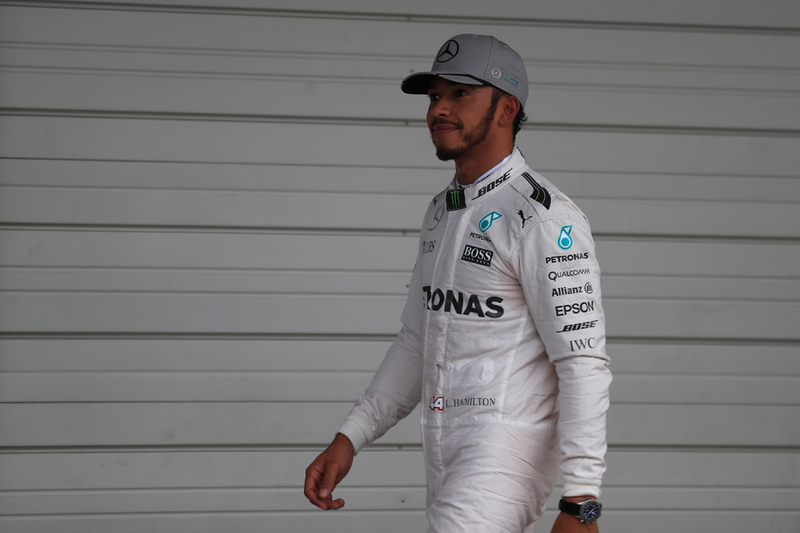 His final mark was a 1m 30.647 and, nip and tuck all the way, in the end Lewis down the road improved himself too but not quite by enough. 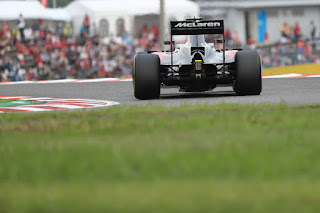 In the end his deficit to Nico and to pole was 0.013 seconds. Or 82cm. This one literally was decided in the margins. 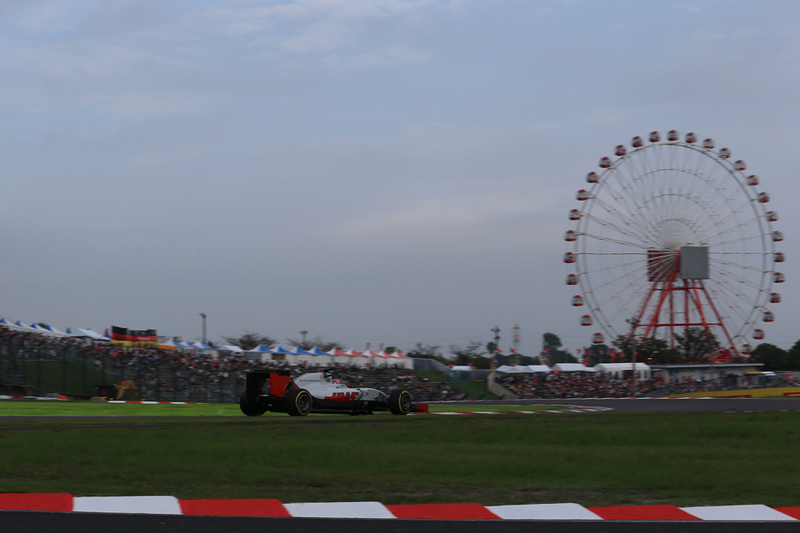 But Nico said he felt assured with his advantage. "The end of qualifying was pretty intense, but I had a good feeling because I knew that if I get the job done and do a decent lap it should be enough" said a resolute Rosberg afterwards of his vital final run. "It was just a good lap, just got it all done properly, that's it. I knew I could do it, I knew I could do a good lap and just the first one in Q3 wasn't perfect so I just had to get my head down and nail it." As for why was it not perfect? "I'm not really sure. I just felt a bit less grip somehow and it just didn't come together so I don't really have an explanation." Not having an explanation became the day's chief theme. 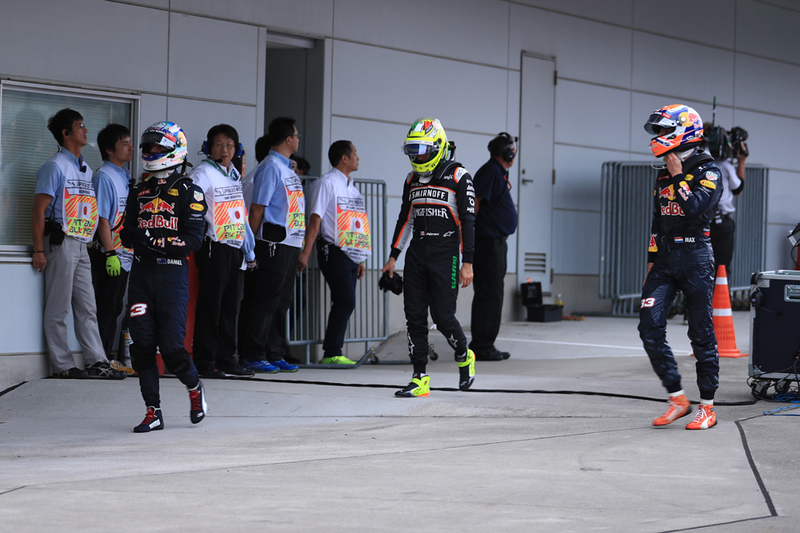 While in an echo of what was said at the outset, Hamilton judging by his words again struggled to get a Suzuka set-up to his taste. "We just kind of veered off on a different tangent in terms of set-up this weekend" he noted, "and it wasn't until qualifying that I veered back so some big changes. It's not that easy to go straight into qualifying with a completely different car so that's why I'm relatively happy with [the result] considering what I did. I think we're in a good position for tomorrow." 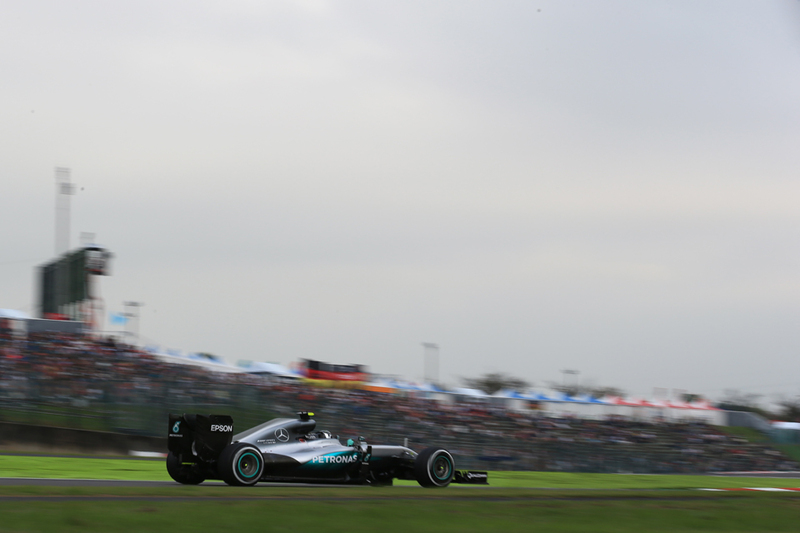 Within those two previous Japanese visits mentioned - and Lewis's two triumphs - there may lay Rosberg's two most conspicuous threats for the race. Last year Lewis did a number on him at turn one on the inside, in effect deciding the race there and then. The year before it rained on race day. Both remain distinct possibilities for tomorrow. As was the case in Malaysia a week ago race strategy is likely to be on the hoof, depending on what's happening with tyre degradation. As was the case there those strategies could vary wildly. The undercut here is powerful too. And unusually the Ferraris and Red Bulls appear right on the Mercs' case. Here indeed in qualifying, where the Merc advantage usually is at its greatest, and on this one of the longer laps, all six cars are within six tenths in the final reckoning. As usual Friday race sims suggested nearly nothing between the three cars on race pace also. It seemed appropriate that on this mighty circuit we got a mighty pole battle, and one that wasn't just about the Mercedes. The explanation may on one level be more mundane though - it's thought that Merc after Sepang and all that is running its engines a bit more modestly this time, and that it's costing significant pace. Next up this time was Ferrari, an outcome that appeared even to surprise the Italian team. 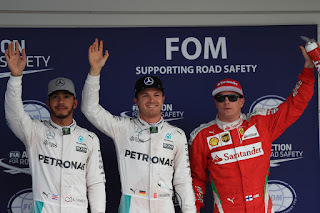 Indeed after ending up close to the Mercs on headline times yesterday Kimi Raikkonen seemed at a loss for an explanation, and after a great showing today that got him best of the rest in P3, his attitude was similar. "It's pretty much the same car that we raced a week ago," he said. "I'm positively surprised with how well the car has been behaving and how quick it has been. "It has been tricky to get the right balance but it's been really good. So far so good. Third is not exactly what we're looking for but we were pretty close. It was not too bad." As recorded though the team's been threatening such a performance for a while, the difference this time was that it made good on it when it counted. This indeed was the view that Sebastian Vettel took. "It's been close also in the other qualifying [sessions]" he explained. "I think [today] we brought the balance together and obviously we had a couple of bits that seemed to work well this weekend. "It's been very close [before] and this time obviously we managed to put both cars ahead [of the Red Bulls], which arguably in Malaysia it was possible and in qualifying we seemed to drift off a bit. "The car's been really good today" Seb went on. "I had small mistakes especially in the final stages of the lap...but all in all it's really been a positive day at a track a lot of people said we don't have any chance with our car. 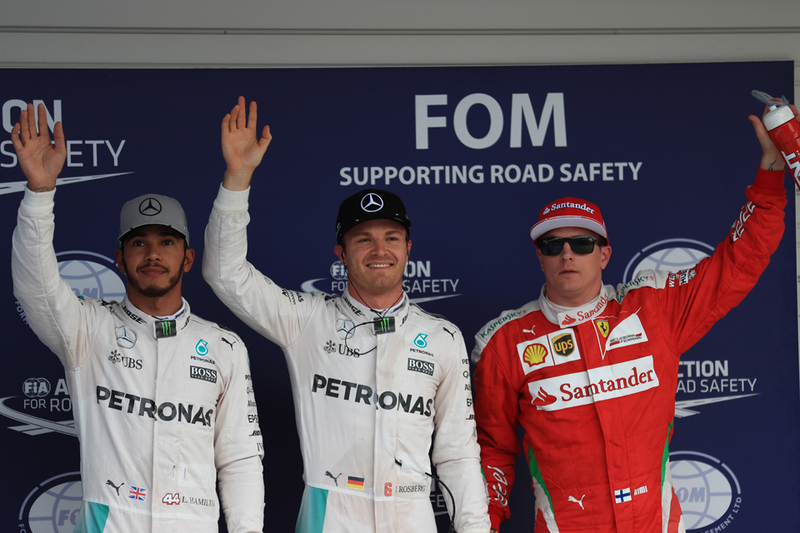 I think we've proved that our car is very good." While we know that Kimi likes fast corners particularly, which this track has plenty of. As seems always the case with the Scuderia these days there was a touch of bittersweet about it even so, given Vettel's P4 is converted to a P7 start what with his first corner boo-boo last week. Or perhaps it is in part explained by that the Red Bull wasn't quite on point. 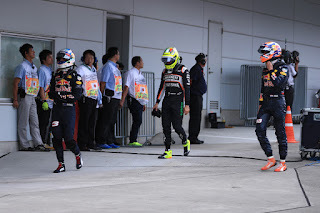 Max Verstappen - whose P5 in qualifying converts to P4 on the grid - certainly afterwards thought as much. "I think somehow today in the low-speed corners it didn't really work out for us, where we are normally very strong," he said. "Maybe because of the temperatures, but we still have to analyse it." This track too has a few uphill acceleration zones which won't suit its Renault unit, and team boss Christian Horner spoke of this afterwards. "If you look at the car's performance through sector 1 it's pretty mighty...unfortunately [on] the run back up the hill we don't have the power...we know the others have got a qualifying mode..."
Daniel Ricciardo, just six hundredths off his team mate and starting P5, also bemoaned his relative lack of straightline speed, though indicated that in his case it was peculiar. "We had a few issues in qualifying, it's a bit frustrating. Frustrating to see how close it is, but, yeah, I was trying. "I was just a little bit slower in the straights. It may have been there from last weekend. It's okay, just a little frustrating. Obviously, you give away free laptime, it's hard to take as a driver..."
All is relative though, given that as noted the Bulls remain but just over half a second off the Mercs, and without the Ferraris getting between we'd perhaps be talking of a fine effort. It was a day for surprises, not least that Ferrari's improvement seemed to pull along its sister team Haas. 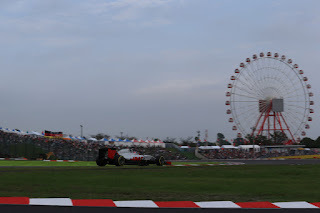 Both its cars got into the top 10 shootout while Romain Grosjean starts P8, having set an identical time to Sergio Perez ahead (a little absurdly though Vettel's penalty means they split and start two places apart). As Martin Brundle pointed out, for all that RoGro's developed the reputation as a moaner lately he still is very good at driving cars fast. It was however a disappointing day for two British grandees. First off Williams, which was a distinct dark horse in advance - Valtteri Bottas had qualified third here in both of the past two seasons - but this time neither Williams even got into qualifying's final part. There was a curious diversion before their final Q2 efforts too, that both cars did an out lap, then came in for a racing pit stop, before doing their runs proper. Felipe Massa insisted though it was all in the plan and didn't explain the car's modest pace. It all seems to tie in though with a sense that this is a team in a state of drift, and has been for a while. 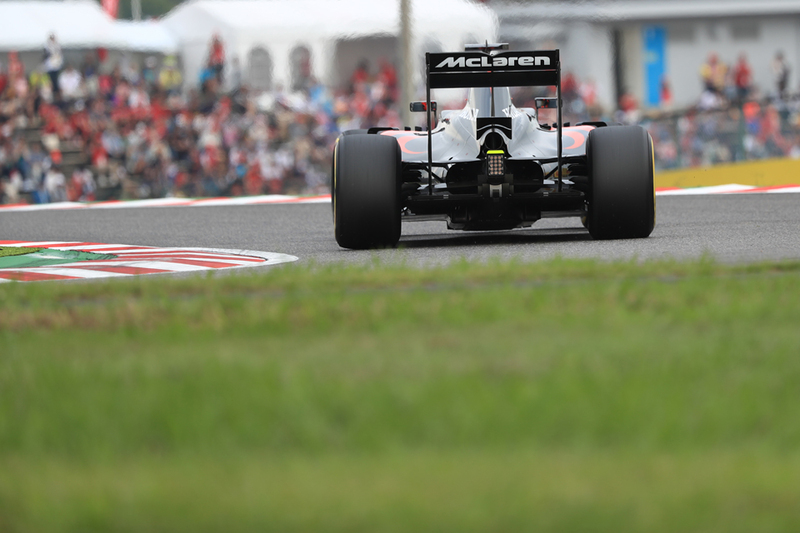 McLaren too disappointed at Honda's homecoming gig. 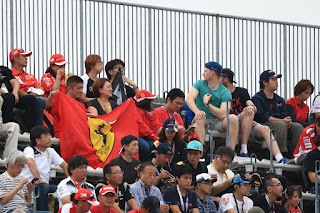 That team was another to scratch heads, as with an upgraded engine and floor (for Fernando Alonso at least - though the engine apparently is lighter and more reliable rather than quicker per se) working apparently fine the explanation for slipping behind even the Toro Rossos was not obvious. Even Alonso confirmed that the team was "a little bit" surprised by the poor show. 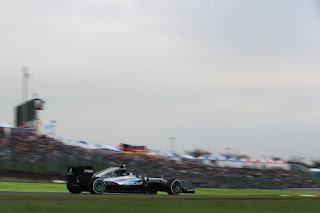 But whatever, Rosberg out front remains in place to control matters - particularly that if he leads from the off he has the assurance that perhaps this track's only downside is that overtaking is not that presentable a proposition. He'll also likely get strategy preference over Hamilton, giving him in effect a rear gunner, and bottom line Nico's looked plain faster than anyone all weekend. He sounded confident too. "For sure there's all the work still to be done" he said. "As we know qualifying isn't all-decisive this year. I still need to get the job done on the start tomorrow, which is going to be a good challenge and there's a bit less grip here. "After that, race pace, strategy, all just needs to work out. "[We] always have an eye on the opposition, but we're feeling good that we can be quickest tomorrow."